Hello everyone! Welcome back to another edition of Ultra Budget Brews, the series that builds entire EDH decks in which no card costs more than $1. It’s been a minute since I’ve had the opportunity to write those words, but I hope in the meantime that the Ultimate Masters preview card, 10 Budget Commandments, and the Top 10 Cards of 2018 kept you satiated! A lot has changed in the intervening months, especially for this series. EDHREC has now partnered not just with Card Kingdom but also TCGplayer, so we get to see price information for cards from both websites, letting you know where you can get good deals on your cards. For this article series, I, ostensibly, get access to a bunch of new toys that I didn’t have access to before. Sometimes Card Kingdom will have the higher price, sometimes TCGplayer will, and for the purposes of this series, so long as one of them is $1 or under, they are eligible for inclusion. Speaking of cards under $1, Rith, the Awakener, the deck that you all had voted for in the previous article, is no longer less than $1, which sadly means it’s disqualified for our purposes. Thus, I called an audible. Who’s our standby? A real doozy, and a fun one for me personally. I am returning to my first ever EDH deck. Let’s go back in time, all the way to the halcyon days of 2014. I had been dabbling in Standard, but knew there was no way I would be able to keep up with rotation or even be able to make it to enough FNMs to be worth it. I wanted to keep playing Magic, some organized format that allowed me to play the cards I had. Luckily, I ran across an article by either Benny Smith or Sheldon Menery about this format called EDH. Needless to say, I was intrigued. I brought it up to my playgroup and expressed interest in trying it out. Thankfully, I’m not one to give up easily (my wife would say I’m ‘obnoxiously stubborn’). I decided to trade in a Liliana of the Veil for $25 store credit (RIP wallet) and used some of it to buy my favorite card at the time, Melek, Izzet Paragon. 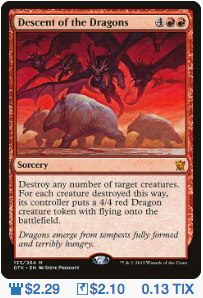 I’ve always loved the Izzet colors, and prefer casting a flurry of spells to rumbling in with creatures. I filled out the deck with random cards in my collection. Cancel? Yep. Cerebral Eruption? Sure, they probably won’t have a land on top of their deck. Burning Vengeance in a deck containing 2 cards with Flashback? Get. In. My. Deck. Spoiler alert: The deck was terrible. Spoiler alert part deux: I was having so much fun I didn’t care. To this day, I wonder what won my playgroup over. Was it my enthusiasm and excitement? Or did they all look at my deck, realize I had no idea what I was doing, and saw an opportunity to pitilessly crush me underfoot, game after game? The reasoning didn’t matter, because they all ended up getting on board. Over time, the deck evolved in to something that was actually playable. It remained my favorite deck until Mizzix of the Izmagnus was released. Melek went from being the commander, to part of the 99, to being cut. Still, I’ve always harbored a soft spot in my heart for Melek, and have waited ever since starting this series to finally build him again. Now it’s time, and I’m beyond excited. It’s a Weird Wizard. I know Weirds are a creature type in Magic, but to me, ‘weird’ will always and forever be the go-to adjective pubescent boys use whenever they’re asked about anything relating to the girl they secretly have a crush on. Yes, whenever I think of Melek’s creature types, I think of shy teenagers unable to express their feelings. I blame this bias on working in the field of education. Melek seems to encourage us to build a pretty straightforward deck. We want a deck full of instants and sorceries, ways to manipulate the top of the library, and ways to turn all our opponents into dust by doubling giant burn spells. In fact, my first draft was exactly that. Counters, card draw, burn, the normal Izzet nonsense. There are two problems with this. 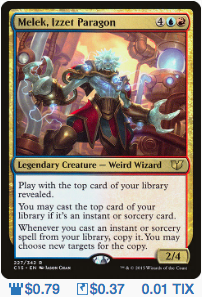 First, the very best cards for manipulating the top of our library are varying levels of expensive, cards like Sensei’s Divining Top, Scroll Rack, and Mystical Tutor. Second, it’s sort of… boring, I guess? Don’t get me wrong, my Mizzix spellslinger deck is my baby, I don’t hate the archetype at all. For Melek, though, it just seems like we would be building a worse version of a deck that has been built a thousand times. We need a change of pace. This is much different. The card that inspired me to go this route was Release the Gremlins. I think this little gem is underplayed, probably because it costs a bit of mana, and making a few random 2/2’s isn’t typically a way to win a game of Commander in an Izzet deck. Knowing this, I obviously had to try and make all of the tokens. Overall, the deck is very straightforward. Most of our token producers are instants or sorceries, which is exactly what Melek wants. Early game, you can use a few of them to ward off early pressure or create early pressure. 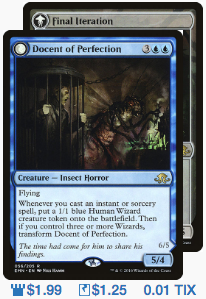 Once Melek hits the board, any token-creating spells that end up on top of our deck literally become twice as good. Once you have a reasonable pile of tokens, cast a Dynacharge or a Trumpet Blast from the top of the library to finish opponents off with style. Some of our most powerful token producers are actually our creatures. Young Pyromancer, Murmuring Mystic, and Talrand, Sky Summoner give all of our instants and sorceries extra value, and 42 of our 100 cards are instants and sorceries. If at all possible, wait to play these until after someone drops the first Wrath. The most difficult part about playing this deck is knowing when to cast Melek. Melek is very powerful, and takes the deck to the next level. Sadly, he also costs roughly a thousand mana, meaning you are unlikely to have leftover mana to cast spells once he hits the field. It also means you can’t afford for him to die too many times. 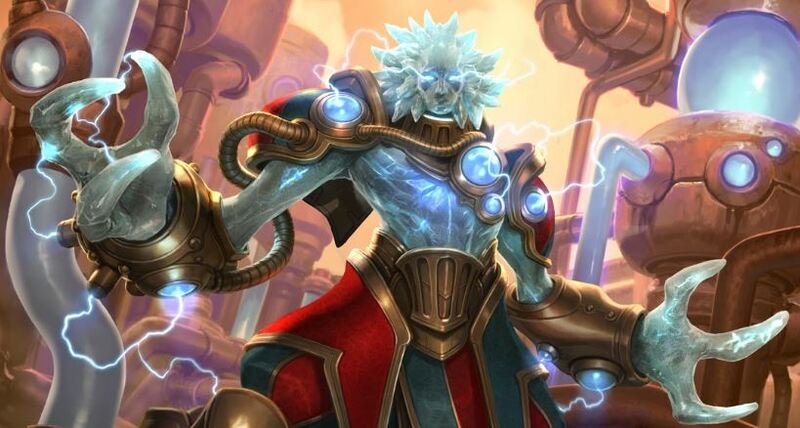 Recasting him once is probably doable, but when he starts costing 10 or more mana to cast, you are unlikely to be able to utilize him except in very long games. Basically, Melek is best cast after you think players have used all their removal, or when you have excess mana to cast spells immediately after he hits the field. 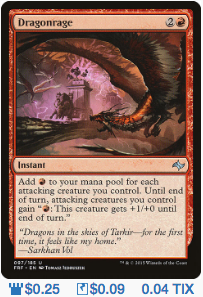 We also have a few ways of manipulating the top card of our library and help Melek out. Crystal Ball is a perpetually underrated card, and it’s perfect here. Foresee is great here, even if it costs four mana. Brainstorm is normally a card I wouldn’t advocate for in decks that lack shuffle effects, but Melek is the exception that proves the rule. The ability to put something from your hand on top of your deck to then cast with Melek, at instant speed no less, is undeniably powerful. There are some games that Melek is simply not going to stick. It’s important that we are still able to win when this is the case. 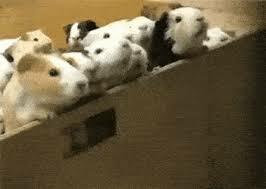 Swarm Intelligence and The Mirari Conjecture help us do this, giving us extra doubling effects. Even if we aren’t able to double our spells, going wide and pumping our tokens will get us there a fair amount of the time. If our opponents make combat difficult, we have cards like Burn at the Stake and Massive Raid to take advantage of our tokens. We also included a couple of ‘X’ burn spells in the form of Comet Storm and Red Sun’s Zenith for the moments you need to get in those last few elusive points of damage. 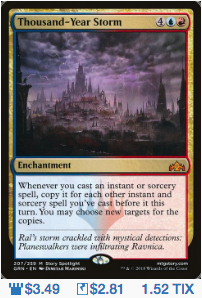 This is the card that made me first realize that Izzet colors are my favorite. It does exceedingly fun, splashy things. Its also ended up on the cutting floor more times than I can count. 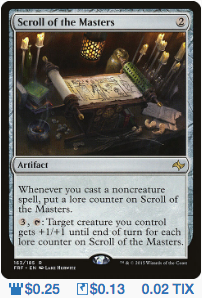 I’ve struggled to find a spellslinging deck that can run it for two reasons: I doesn’t work with ‘X’ spells, and it doesn’t work with counterspells. I love both of those things, and as a result, this card always underperformed. Hopefully, Melek can give it new life. While there are a few ‘X’ spells and counters in this list, there are few enough that this has a reasonable chance of working out. This is a card I’ve never played with or seen played. I think it’s perfect here. Obviously, we only want to use this on our attack step. What may be less obvious is that you need to use all of the mana this makes during the attack step, as it will disappear once it’s done. Use this to kill a huge blocker, as a mini Wrath, or to get in a bunch of damage with the one unblocked token! Also, since this card isn’t popular, it’s not something people will expect. This card is a bit speculative, but it seems like it fits well here. It only costs two mana to get down, and it triggers off of noncreature spells, which is most of our deck. This turns any creature into a threat in a hurry. It’s a bad top deck late game, but it’s powerful enough when it lands early that this is an acceptable risk. For extra fun, use this to attempt to get a commander damage kill with Melek. We are almost never using this without Overload. We need to have a board presence for this to work, but when we do, this is the exact sort of card that KO’s opponents out of nowhere. It’s a Triumph of the Hordes that doesn’t make you hate yourself afterwards. I just recently started playing D&D with friends. I am totally new to all of it and decided that my character would be a Druid, because turning in to a variety of animals is rad. Dire wolves, giant toads, and bears are all great, but in my heart of hearts, I wanted to morph into a dragon. 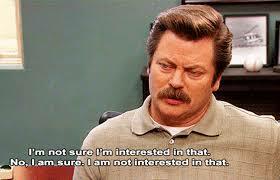 The DM informed me that my hope was unlikely to come to fruition. So, I’ll settle for Overloading this, turning all of my little 1/1 Goblins and Elementals into Dragons, and swinging for lethal. Live the dream! As always, these are cards I’d add if I weren’t concerned with a strict budget restriction, if I had a copy laying around, or if I was looking to up the power level of the deck. 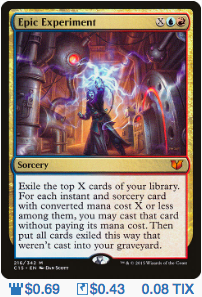 Fair warning: I will be hard-pressed to not talk about this card in every deck with Izzet colors. I know, I have a problem, but understanding and acceptance are the first step to recovery. The second step is hope, and I sincerely hope I stick this card every game. Well, I got 1 of 12 down. This will allow you to draw copious amount of cards, make lots of tokens, pump your tokens to crazy heights, or just burn your opponents for lots of damage. For maximum fun, pair this with Battle Hymn or Mana Geyser. This works best with lots of mana. I’m sure you are shocked to hear that, but even if you only manage to copy two spells with this card, it’s probably earned its slot. I never see this card and I’m not sure why. Another favorite of mine. 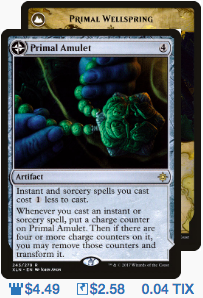 Primal Amulet does everything this deck wants to do. It makes your spells cheaper, allowing you to cast more of them, and eventually doubles one spell of your choice every turn. Yes, it costs four mana, but it has a high enough ceiling as to make that drawback almost irrelevant in all but the fastest playgroups. This is basically a Dragonshift that costs less mana, makes your creatures Dragons permanently, and can even be used as removal in a pinch. 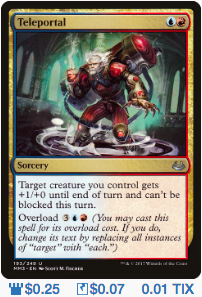 Yes, cards like Cyclonic Rift absolutely blow this out, but that is also true of basically every card that has ever been printed. 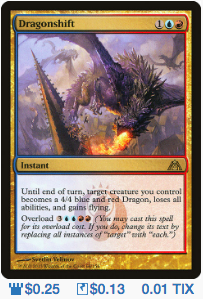 Even making two Dragons with this card is above-curve. This seems like a great inclusion when we step outside our strict $1 budget requirement. 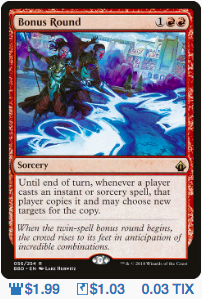 A card that makes tokens when instants and sorceries are cast and then gives those same tokens an anthem later is, indeed, perfect. I’ve never actually seen anyone else run this in a deck, but it will slowly take over games when it’s allowed to live. What did you think of the deck? Have you seen a deck in these colors like this in the wild? What would you have changed? Let me know below! For this week’s pool, I realized I haven’t ever written about a Golgari commander, so here are a ton of awesome Golgari options! Vote for whichever you’d most like to see get the Ultra Budget treatment! Also, I have recently joined Twitter (@BrewsMtg) and would love to connect with all of you there.